I recently completed a three-concert cycle of these composer’s works in the Isabella Stewart Gardner Museum in Boston. Instead of focusing on labels, however, with the hope of enriching the listening experience I wanted to draw the attention on the composers’ own interests: Debussy in poetry, Bartók in folk music, Boulez in the curious concept of abstraction. The three composers we chosen for their central place in the 20th Century repertoire, in particular among piano literature. Like all cultural icons, their art is both reactive to the world and reflective only of itself. As a unifying theme, the concert cycle payed tribute to Pierre Boulez who passed away last year. Deeply aware of (and concerned about his own place in) the canon, Boulez’s music can be seen to articulate the beauties found in the music by Bartók and Debussy. Violinist Corey Cerovsek joined me for the two outer concerts. Below are the program details for the cycle and below a text exploring the works. Known today as the embodiment of Impressionism in music, Debussy himself was not keen on comparisons between his music and the blurry lines of Monet or Turner. Debussy left behind hints about his conflict on the issue of musical imagery: on the one hand, he thought it was “more important to see a sunrise than to hear the Pastoral Symphony,” while on the other hand, as he wrote in a letter to the composer Edgar Varèse that he “liked images as much as music.” Debussy’s nuanced relationship with the worldly inspirations of his music links him with another artistic movement, Symbolism. The movement was active especially in the realm of literature and Debussy often used in his music texts from the iconic Symbolist writers, among them Charles Baudelaire and Stéphane Mallarmé. The Symbolists’ view of the relationship between the object and its reaction was specific: a work of art was to express and elaborate the sensation caused by its subject, not merely describe it. While first and foremost a literary movement, the ideas of Symbolism influenced composers and painters alike, among them James Whistler who resided in Paris for many years. The exchange between visual arts and music was made manifest in many of the titles given to works by artists like Whistler and Debussy, the former giving musical titles such as Nocturnes to his paintings and the latter inscribing his compositions with pictorial titles such as Images. Written in “memory of Frédéric Chopin,” Debussy’s large piano cycle Études (1915) emerged soon after the composer had edited Chopin’s famous Etudes for the publisher Durand. The careful study of Chopin’s musical text inspired Debussy. Having been unwell for some time, he now found himself in an industrious mode; he completed several major works including the Études cycle during the summer of 1915. Unlike the popular and, indeed, somewhat similar piano cycle Préludes, the Études were seldom performed during the decades that followed. En route into the mainstream repertoire, the Études benefitted from promotional work by pioneers such as Olivier Messiaen and Pierre Boulez who focused attention to the pieces’ visionary qualities. The moods of the Études span from the Wagnerian elan of Pour les octaves to the Schoenbergian inwardness of Pour les quartes. The most popular of the pieces Pour les arpèges composés is among the most “impressionistic” works by Debussy in how the functional nature of the harmony is disguised. The six pieces forming the cycle Children’s Corner (1908) evoke adult recollections from childhood. The set bears a dedication to Debussy’s daughter Claude-Emma or “Chouchou” with “tender excuses of her father for that which follows.” The whimsical pieces bring dolls to life and color childish fears acutely and poignantly. The English of the title resonates with Debussy’s admiration of the British and perhaps as well that Chouchou had an English tutor. The Violin Sonata (1917) is the last composition Debussy completed. The opening movement of this neoclassical work oscillates between the pensive and the rigorous. As in many of the composer’s serenades, the middle movement, Intermède, marks a turn toward exploration of the world of fantasy before launching into the Sonata’s salient finale. Debussy held the musical abilities of a gypsy violinist called Radics in great esteem, in particularly his manipulation of color and rhythm. Perhaps this regard found its way into the subtleties of the Violin Sonata. The Hungarian composer and pianist Béla Bartók was born in what is now modern-day Romania. His father was Hungarian, his mother German, and his grandmother Serbian. During the early years of the 20th Century, a European-wide interest in cultural heritage gripped the young Bartók. The previous century had seen a vast amount of collections of national repertoire resulting, for instance, in songbooks like Des Knaben Wunderhorn in Germany and Das Volkslied in Austria. Bartók joined the ranks of this ethnomusicological endeavor and embarked on collecting and cataloging folk songs from the eastern part of the Austro-Hungarian Empire. Austria-Hungary was a multicultural super-power in its time. The First World War blasted the empire apart but, even while going down, self-reflective efforts of cultural mapping continued. Bartók, for example, was called to participate in a project of recording the national music of captives in the nation’s prisoner-of-war camps. Bartók’s musical language originated from the many different, often powerless and exotic cultural pockets of Austria-Hungary. His compositional style synthesized elements from folk music, references to contemporary modernist styles of composers such as Debussy and Schoenberg, and traditionalist influences of composers like Brahms and Mahler. Listening to Bartók’s music written after World War I, one cannot escape the hearing this stylistic mix in the context of the European world in ruins. The Sonata for Solo Violin (1944) was composed during the composer’s final creative period when he was already suffering from leukemia which ultimately proved fatal. The work is the only four-movement sonata Bartók composed, which, in addition to the movement titles (Tempo di ciaconna, Fuga), indicates a relationship between this work and the solo sonatas of J. S. Bach. Musically the Sonata is perhaps less restorative than other works from Bartók’s last year; its moods offer little solace and the nostalgia prevalent in works like the Concerto for Orchestra and the Third Piano Concerto is absent. Instead, the first two movements hark back to the anxiety of his works from the 1920’s and the reflective third movement shows a quoted Brahms fragment in the process of dissolving. The frigid elegance of the Sonata’s finale ends the work somewhat mysteriously. Im Freien (Outdoors Suite) (1926) is Bartók‘s reworking of the idea of “Pastoral” music embraced by numerous composers of the Baroque, the Classicism, and the Romantic. The titles suggest the pleasures of the bucolic, but the listener is presented with a denial of anything constructive. As an example, the second movement, Barcarolle, opens with a brief allusion of the lulling beauties of a traditional boat-piece, but the piece soon falls into the absentminded vertigo of a psychological dead-end. Bartók’s version of “night music” in the fourth movement is less perfumed than Debussy’s and less metaphysical than Mahler’s. It speaks to coldness and isolation. While a Chasse had served as a jolly and brilliant closing number to many classical works, Bartók;s finale is no aristocratic sport, but rather a devastating manhunt. A significant token of Bartók;s ethnomusicologist endeavor, the Improvisations on Hungarian Peasant Songs (1920) is a set of eight short pieces, each based on a folk tune which Bartók included with the score. The work is open to many interpretations. It can be heard as mapping the space between a recognizable theme and the composer’s far-reaching imagination. The nostalgia and, at times, sheer compositional ferocity with which the folk tunes are treated can be heard as an elegy to the wealth of the cultural identities recently crushed by the First World War. The seventh improvisation is dedicated to the memory of Claude Debussy. Pierre Boulez entered the stage a war later and his role as a lead character of the avant-garde lasted until well into the 21st Century. As a composer he was deeply rooted in the heritage of the Second Viennese School (Schoenberg and Webern), as a conductor and musical thinker he came to champion the music of both Debussy and Bartók. The Swiss-German expressionist painter Paul Klee influenced the young Boulez profoundly. To be sure, many composers of the era sought ideas from the realm of visual arts and architecture while the previous generation of modernists had found inspiration in Freud’s psychoanalysis. In Boulez’s words: “I don’t believe that musical structures, in their strict sense, can be transformed into pictures. But it is possible to take lessons from other arts, and I have especially admired Klee’s ability to encapsulate and direct ideas. 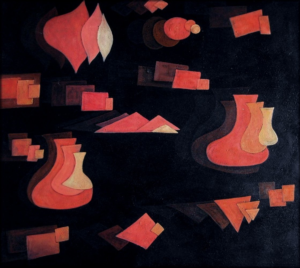 This has often resulted in effective compositional advice.” The featured image on this post is a picture of Klee’s painting Fugue en rouge (1921). Crisp dodecaphony, subtle Debussian rhythmic-melodic modules (or motifs), and conciseness of structure are hallmarks Boulez’s Première sonate (1946). By 1946, the sonata’s historical baggage was surely so heavy that a true reformer would not consider turning to it, would he? Yet Boulez, much like Beethoven in his last sonata, Op. 111 (which Boulez performed in the entrance examination to the Paris Conservatoire), aimed at the heart of sonata thinking: the tension between two musical situations and the poetic elaboration of this tension. The work’s every interval and motif-pair (a melodic figure followed by a wild burst or an explosive chord followed by an ironic staccato jolt) cultivate a dialect whose irregularity creates a kind of continuity. The Sonata’s language is founded on oppositions; its structure, too, is built upon contrasts. The first movement’s primary section is essentially slow (but with intervening manipulations of brief, fast-paced motifs.) From time to time, this free-sounding section is interrupted by more angular music, conversing by way of rhythmic variation. The second movement sets off as a manic toccata, which is pushed away at times by an ethereal two-voice texture, a sort of dodecaphonic invention. The two movements, dualistic themselves, thus, mirror each other. Then came the earthquake. Justly nicknamed “the Hammerklavier of the 20th Century,” Boulez’s Deuxième sonate (1948) became a cult piece already before its premiere, as the score circulated for two years before Yvette Grimaud had learned the piece for the first performance. Boulez lived fast in the 1940s. He began his collaboration with the poet René Char and fell under the spell of the paintings by Klee, Kandinsky, and Mondrian; he read Joyce, Kafka, and Mallarmé. In his music, Boulez revamped dodecaphony by applying the tone row flexibly. His take on the technique was based on motifs as he decided not to be bothered by the inherent hindrances of the strict twelve-tone system. The Troisième sonate (1958–63) is an unfinished work. Originally, it was designed to comprise five movements, but shortly after the premiere given by the composer, Boulez withdrew three of the movements. The Third Sonata was one of Boulez’s main vehicles in his work with open form, a concept that widely interested artists at the time. Open form in music represented a new take on temporality. Composition as a directional event with a beginning, middle, and end was a construction that artists sought to abandon. The Third Sonata requires certain choices to be made by the performer. These decisions make each performance (or at least the version by each performer) unique. The work is also an example of musical pointillism: the musical material is arranged as fragments and it does much to avoid lengthy melodic shapes, expected phrases, and buildups. Four cyclically organized sections form the Trope-formant (Boulez calls the movements formants). The performer must choose which section to begin with, after which the three other sections follow in a predetermined sequence. In two of the sections, Commentaire and Parenthèse, some of the music is placed inside parentheses, and whether or not they are included in the performance is a decision left to the performer. The Constellation/Miroir-formant is a compilation of six sections each formed from a number of fragments of different lengths. The possible routes through the fragments are explained by a system of arrows in the score; the choice of the route through the score is left to the performer, but within rather strict limits. Boulez has described the Sonata’s score as a map of some unknown city which the performer must walk though at her or his own pace, but without missing a single sight. Posted in Composers, Concerts, Musicology, New Music, Program Notes. Bookmark the permalink.